Some might argue telecommunications and airline service are analogous sorts of industries. Both are extremely capital intensive, both originally were operated as monopolies or oligopolies, the assets often owned directly by the government. Both have been privatized and become competitive industries. Both industries have been profoundly affected by new technology and have become suppliers of products widely used by consumers, where once they were largely used by wealthy users. Where both industries might once have competed based on quality, now both industries must compete on price. Both industries routinely rank at or near the bottom of consumer satisfaction surveys. Both often are criticized by consumer advocates for offering low quality and high prices. Both arguably are tough industries, however. Consumers want (consistent with safety and consistency) low prices. But low prices are an issue for suppliers, in terms of sustainability. Over the last 60 years of commercial aviation, airlines have not come close to recovering their cost of capital, much less actual profits In fact, airlines have had average profit margins of less than one percent on average over that 60-year period. 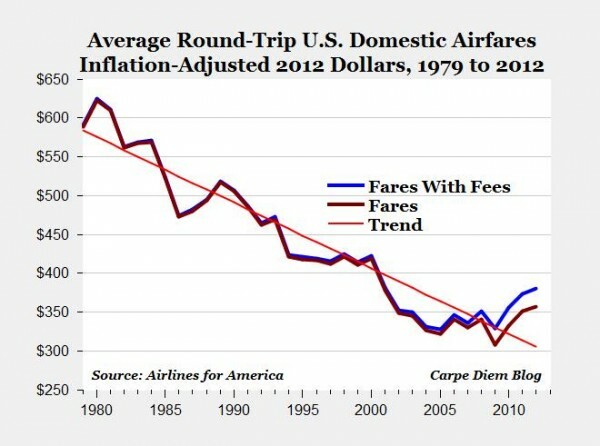 In 2012 airlines made profits of only $4 for every passenger carried. In 2014, airlines might have unusually “high” margins of 2.6 percent. Adjusting for inflation airfares are lower in 2014 than they were a decade ago. In 2011, airfares were about 40 percent lower than in 1980, adjusted for inflation, even when baggage fees and other ancillary charges are included. Observers often complain about nominal U.S. prices for Internet access or mobile service as well. One might make the same observation about Internet access, mobile service or mobile Internet service as well. In developed nations, including the United States, cost as a percentage of household income ranges from half a percent to 1.7 percent of household income. Costs are far higher than that in the developing world, for example. People likely will continue to complain. But neither industry will have an easy time providing low prices, high quality and also geneate sufficient profits to continue to invest in the business. Airlines historically have had a harder time doing all three. But telecom providers increasingly are finding themselves in the same fundamental situation.